You can either choose a template and add your photos, or go freestyle and put photos, and text where ever you like. 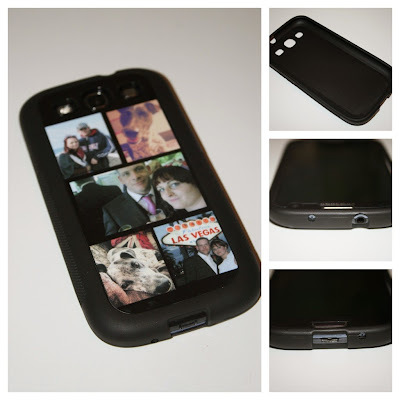 You can see in picture one it has the Case i chose, a Samsung Galaxy 3 case in Black with a rubberised finish. 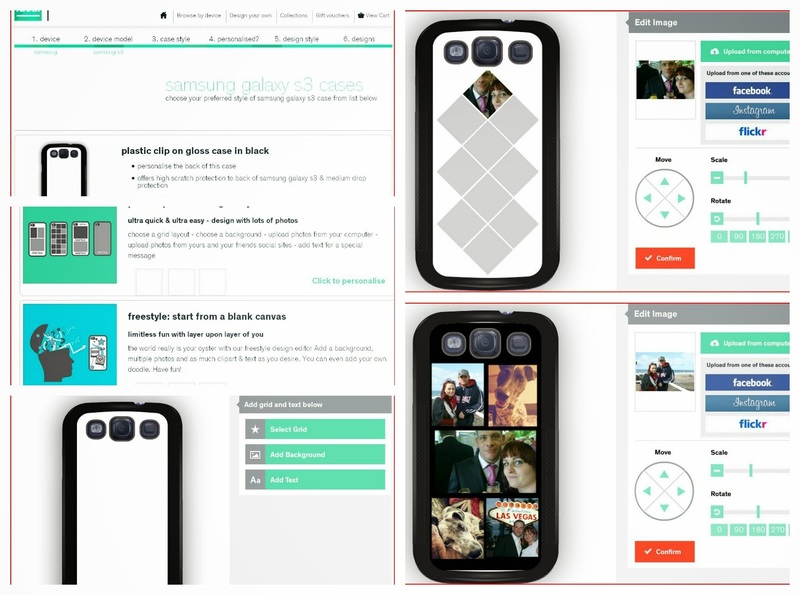 (it had better protection for my phone as I'm so clumsy) - The next screen shot is of the option to choose between Choosing a template, or going freestyle. You are then shown a blank canvas, you have the options to the right for Selecting a grid, adding a background, and adding text. You can also see one of the templates i tried out. I didnt want to waste photo space so in the end i went with the collage with 5 pictures. Ideal cases allows you to upload photos from Flikr, Facebook, Instagram and your own PC. After i had placed my order it took approx 4 days to arrive which wasn't bad going considering its printed to order. My initial reaction was how rigid the case was, its pretty solid which is good as my poor phone needs some protection. The photo part seems to just be a fairly strong thin piece of plastic thats stuck into the case. (I know this as i can see the corner is slightly coming up in mine already after a weeks use) I pushed my phone into its new home and then i took it out again... and the case is so rigid it pulled the back cover of my phone off, and it got stuck in the new case... now if you have a Samsung Galaxy III you will know its a bugger to get the back cover off. I have ripped my nails off trying to get it off. Least i know that this thing will pull the cover off should i need to take the battery out.. ha! Ideal Cases: Samsung Galaxy III cover in black rubber. As you can see from the picture above the case is Black and in a rigid rubber. Its of a good quality and the case fits it well. You can easily plug the charger and head phones in. The speaker and camera have plenty of space around them to function. The case cost a total of £14.99, i am on the fence about the price. I would spend that on a gift for someone, but i definitely wouldn't spend that on a case for my self. thanks for the review Georgia. Hint taken :) we are adding the nexus 7 cases to the range in the next few weeks. How to make Pizza... the weight watcher way! Whats in my 'Just Fab' Bag?! Natures Health Box Review & Discount code! Hello Kitty Themed Gift Exhange! Boxing day Sales - LUSH & a rude wake up call..